I meant for this post to go out last weekend, but I was struck down by the noro virus and was so poorly I didn't get out of bed for 2 days. The thought of food let alone anything sickly sweet was just not on my radar. I am much better now though and normal chocolate eating habits have resumed, now I believe that Easter is just trying to make you fat, because everywhere you look there as chocolate eggs, and cakes and no end of nice sweet things to entice you. 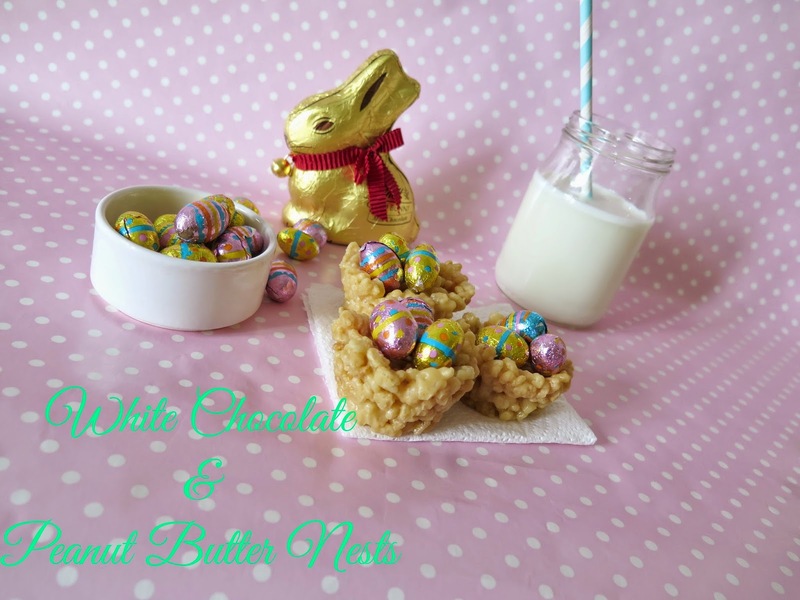 I have completely fallen victim to the heaven that is white chocolate and peanut butter, so decided to whip up some rice krispie nests using this dreamy combo. Easy as pie to make, just melt white chocolate in the microwave or bain marie and stir in some peanut butter until combined. Mix in enough rice krispies until the mixture is all coated and not too wet, then spoon mixture into cupcake cases building up the sides a little to leave a recess in the centre that will be filled with eggs. Put them in the fridge to set for an hour, when they care cooled fill with little eggs of your choice. 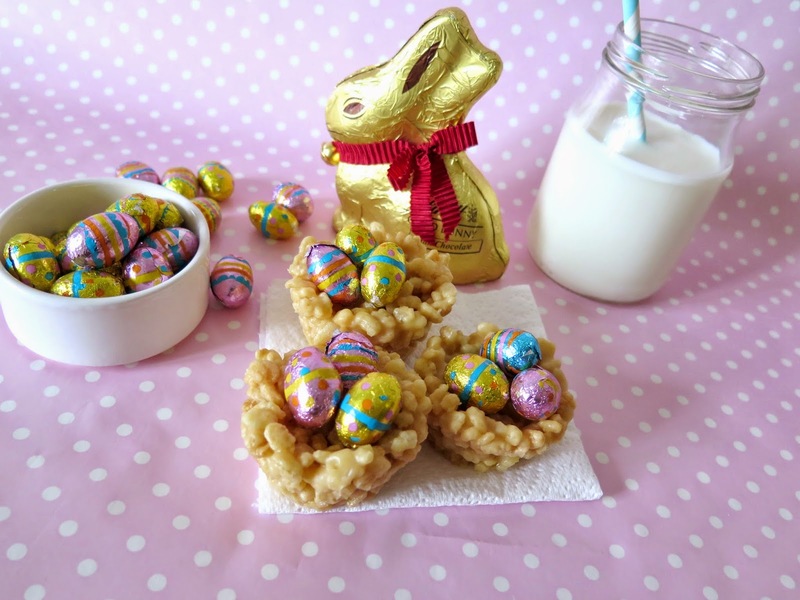 I had intended on using mini eggs but the supermarket had sold out of them. Spring/Summer 2015 collections are filling up the high streets rails at the moment, the bright colours and floaty fabrics have hit the shelves even if there is still a little chill in the air. This past weekend I was invited along to the intu fashion show at Lakeside shopping centre to see what the big brands have in store for us this season. The show was really well put together and featured lots of amazing dancing. I was really glad to see acid green featuring heavily in the Primark collection because I bought a beautiful acid green dress last year and was worried it would be out of fashion too quickly. So I'm very happy I can try and get a bit more wear out of it this year. It seems this season is full of cobalt blue, acid green and lots of wedge sandals, all of which makes me quite happy because I love all three! After days of searching for some of the items seen at the fashion show I managed to find this beautiful sheer skirt from BHS. It's £18 and would great as you stroll down the beach on holiday! 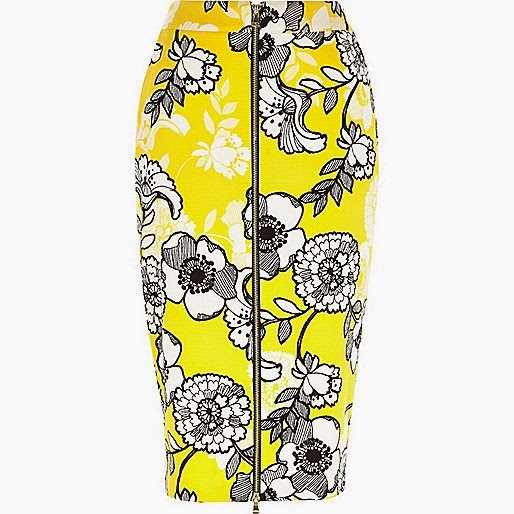 I don't know about you, but I am looking forward to a spring full of bright colours and bold patterns, I found this little beauty from River Island and thought it was stuning. I think it would be lovely teamed with a simple white strapy top and perfect for some sunny weather. One of the best parts of the show was the dancing, the kids were great and danced really well. I especially enjoyed the segment for JD sports. What are you guys most looking forward to about the warmer weather? Any trends you're excited to wear? Yes it's another OPI nail polish, I'm sorry but I love them so much. Today I'm going for a lovely spring colour, a pretty pale pink that will hide a multitude of sins in the rushed nail painting department. Isn't this the cutest candy pink, and just to show you quite how candy coloured it is I have matching pink candy pieces on the cupcake! How about that huh! It's such a pretty shade to wear, looks sweet and girly if built up with a couple of layers, or just adds a hint of colour of you only do one coat. I have used this shade a lot, and has been in my top 10 for about 5 years now.